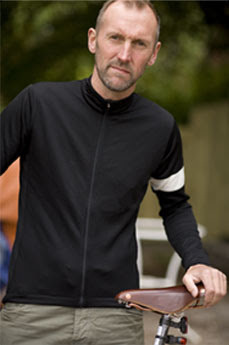 I stumbled across a fantastic cycling blog today - Nick Hand's Slow Coast. Nick has been cycling the 5,000 miles around the coast of Britain tracking down artisans (from a lobster-pot maker in Cornwall to fashion designer Paul Smith in London) since June. The site features Nick's gorgeous pictures (he's a professional photographer, and boy does it show!) and he's also made mini 'soundslide' documentaries with some of the people he's met. The site is a thing of real beauty, both in terms of the images and layout, but also in terms of the love that Nick has obviously put into the whole project. He's now on the final stretch of the ride, almost back to where he started in Bristol. I don't know whether to feel upset that I wasn't there to follow the journey, or glad that I've discovered a treasure-trove to devour over the coming weeks. Thanks for the link to Nick Hand's Slow Coast blog - enjoying it already. Even my wife is interested as I read out sections! Must have been a great experience and i'm very jealous! Look forward to more posts. It's amazining !! Scratch has been cycling the 5,000 miles around the shoreline of Britain finding artisans (from a lobster-pot producer in Cornwall to mold creator Paul Smith in London) since June. 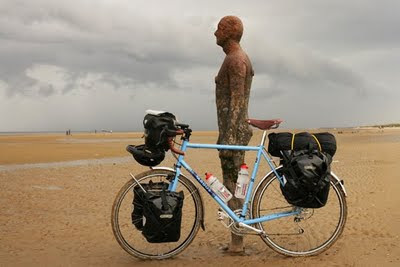 Nick's Bike with Antony Gormley's statues on Crosby Beach, Lancashire,The site features Nick's gorgeous pictures (he's a professional photographer, and boy does it show!) and he's also made mini 'soundslide' documentaries with some of the people he's met.